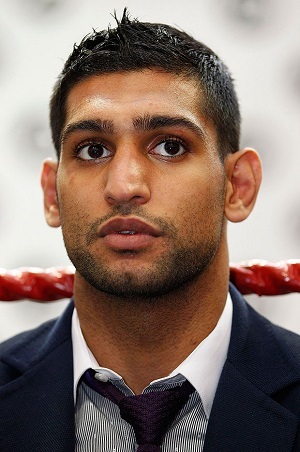 By sticking to his religious obligations as a Muslim, former light welterweight world champion Amir Khan cost himself an opportunity to fight boxing’s No. 1 attraction, Floyd Mayweather Jr., this year. But the door is still open for Khan to face the sport’s No. 2 star, Manny Pacquiao. Mayweather’s camp announced last week that the undefeated welterweight champion’s next match — against an opponent yet to be named — will be on Sept. 13. Khan had previously stated that he wouldn’t be able to fight on that date, as it would be too close to Ramadan, the month in which all able-bodied Muslims are required to abstain from food or drink during daylight hours. Ramadan falls between June 28 and July 27 this year, and Khan has said a mid-September date wouldn’t give him enough time to get his body back in optimal condition to fight. So with Mayweather out of the picture, promoter Bob Arum has mentioned Khan as a possible opponent for Pacquiao, the WBO welterweight titlist who is scheduled to fight again in November. As with everything in boxing, a lot depends on which fighter is aligned to which major promotion company — Arum’s Top Rank and Oscar De La Hoya‘s Golden Boy being the two heavyweights in the business — and what other possible Pacquiao opponents like Canelo Alvarez and Juan Manuel Marquez can fit into their schedules.